This set is easy to obtain ingame; even if you can't RNG, you can still easily get the two IVs that matter (atk / spe) with a combo of power items, everstone, and luck. Outrage can be tutored on if you don't want to chain breed and substitute is dumb in HGSS but you can cheat voltorb flip with a calculator, which may legitimately be faster than trading from dppt because the trading animation is so slow. you need a base gible in hgss from dppt if you're going to do it there, so remember to put a substitute tm (functionally buyable in dppt) on it if you do that. autoloses to the sash / ice shard weavile. has a solid 70% chance to lose to blizzard / ice shard glaceon that lives your outrage. clear dark + ice first to avoid both early on and pray you never see them. best order is probably something like ice > dark > ghost > water > ground > normal > psychic > steel > bug > fight > flying > grass > rock > poison > (electric / dragon / fire). a list of battle hall pokemon can be found in this post. I'm in the process of testing out a new battle castle team and I'm happy to say that I manufactured it myself. I hated the fact that I copied Bozo, not exactly, but with slight modifications(Putting a Scarf on an Adamant Salamence rather than a Band on the Jolly natured beast). I prefer the speed advantage against faster pokes. (Almost feel like teams should be copyrighted by their users.) Changes to movesets, Spreads, etc. should be permitted, despite having the same three pokes. My intentions aren't to make rules here at all. I'm just just tossing out thoughts. Any opinions? Took me about three weeks to get this genderless wall ready during the Summer back in 2011. I'm currently at 14 wins. Hello everyone! Thx to yeg3 for your answer. The idea is a simple one: Smeargle attacks Camerupt with Storm Throw to activate Anger Point, giving him 6+Atc to sweep anything away. To make this happen there is Trickroom support, and with Iron Ball Camerupt is slower than anything in the Subway. So in the first turn there is Fake-Out for dangerous Pokemon or Protect and Trickroom. In the second i switch Zong out for Camerupt who gets Storm Throw from Smeargle and 6+Atc. Then maybe again Smeargles Protect to draw in attacks or switch any of the others in, likely Zong for Psych Up on Camerupt to get also 6+Atc (this idea isnt mine, i saw that on ones team in the record list ;)). All Pokemon run Protect, so if i got a Pokemon advantage, i probably often can carry the win away with Exploding.. My fourth Pokemon, Gyara, should do an excellent job, since it covers any weakness of the other Team members and even more, and its own weaknesses are covered also by the team. Furthermore there is Intimidate, which is so nice to have in Doubles and makes switching even easier. If i predict a Water Attack on the outswitching Zong i can first get Gyara in instead of Camerupt, and in the next turn bring in Camerupt since Gyara probably wont be attacked by Water. I thought of giving him Speed, to be able to act in the last Trickroom turns. One Dragon Dance, and Protect when needed to get out of Trickroom, and then sweep in normal Dimensions. If Smeargle stays alive and non-outswitched, it can annoy with Spore or damage Sturdy/Focus Sashes with Storm Throw as necessary or using Protect to draw in attacks, since its defense is horrible. I guess Dragonite or Salamence can also do a good job instead of Gyara because the weaknesses are also covered. What do you think of that team? As i mentioned before i couldnt test it, because i dont have it yet. Apart from this i could imagine that one could have a happy time with it, as long there are no evil things like two KOmove-users in the beginning, Hax, or special things i havent thought of. I did some calcs for camerupt with 6+Atc, and checked which Pokemon can survive an attack from him. 13 Pokemon, plant and bug-types can survive EQ because of their resistance (at least their most defensivest sets). Shuckle and Forretress as only Mons can survive a neutral EQ, but they have sturdy anyway. There are 11 other sturdy users to be aware of. There are 38 Focus Sash users, very many, but luckily you can face only one at a time. From the 25 Flying type Mons only 3 (Skarmory, Gliscor, Landorus) can take Rock Slide. These 3 also can have Focus Sash or Sturdy. Almost all 12 Pokemon with Levitate have very defensive sets, that can survive Rock Slide. The 10 Air Balloon Pokemon and their Electro attacks i dont fear. Omg! What happens if in the first 2 turns where i mostly wont attack, a foe starts cursing??! Ok, lets see. Camerupt is at 20 Speed with Iron Ball, which means all Pokemon up to 40 Speed should be taken under consideration. There is Steelix, which is slower than Camerupt after one Curse; fortunately his best attacking move against Camerupt is Payback. In fact, the most Curser in the corresponding Speed Range really arent dangerous to Camerupt, since they often have only Gyroball and other very weak moves. The only exception is a Gigalithset, who has 40 Speed, which means there is a tie after 2 Curses. If I face one (or other similar Pokemon), i think its the best to Fake Out, so there is one potential Boost turn less, and it damages Sturdy, which is very likely on these Pokemon. My conclusion is, that on Cursing foes one should be able to handle them with relative ease. By the way, this team got some inspiration from the Bellydrum-Trickroom-Psych-Up-Team created by some_guy. Thank you, your idea is really cool! I'm positive that Peterko started the thread for Subway records, then again, I believe NoCheese is the new moderator. 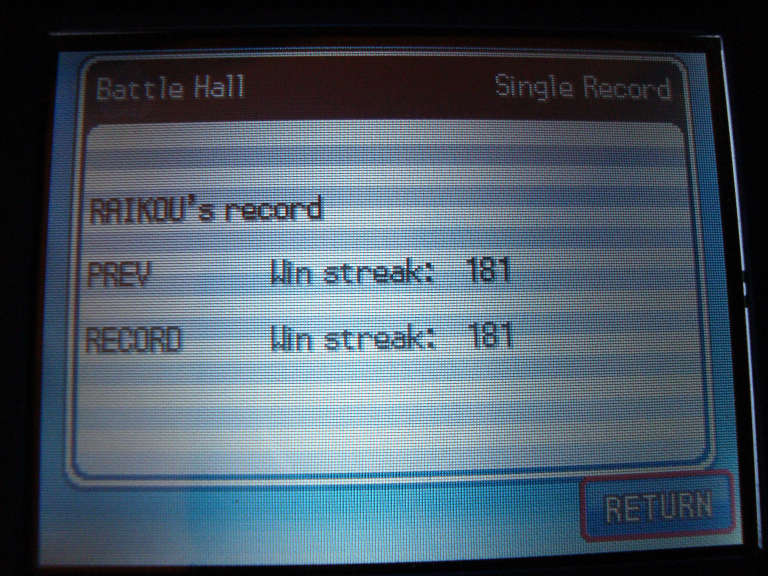 Once you have your streak, just post to the 5th generation record thread. You can also add other users with posts. Actually, officially Peterko is still the recordkeeper, it's just that, since no one has bothered to post a legal streak here in forever, there has been no need to find a new mod to be updating it. If you manage to set an eligible streak, by all means post it with proof--I would be curious to see what the admins would do regarding this thread were that to happen. I would definitely recommend changing up Gyro Ball on Bronzong--because of how many bulkymons there exist in general, and due to how many Normal resists are also able to tank Gyro Ball comfortably, I would seek something with more PP in case you can't immediately blow up. Iron Head is the most consistent option. If you are determined to speed up the process to bring Camerupt out, you could alternatively place some extra support (Sunny Day/Safeguard/Gravity/etc.) in that slot and just stick with Explosion. Thanks for your answer. Yes, Iron Head sounds like a good alternative to a weak gyroball against slow and bulky mons. I think it's pretty great that this topic got some activity after being revived. Not just a single bump but a whole page of discussion :) Back in April I picked up my SoulSilver file again to play the Pokeathlon (I didn't find a Smogon thread for that). After grinding high scores for a month, I moved on to the Battle Frontier to continue some unfinished business (I only had 2 gold symbols before, now I have 4). There is one semi-interesting thing that I can post which I don't think has been done before. This is the very same Gamestop Raikou that made me learn how to RNG in 2011 just so I could get a perfect one. Something about his unique coverage with Aura Sphere coupled with his cool shiny design made him one of my favorite gen 4 Pokemon since he was released, and he's been one of my go-to ingame Pokemon for years. I used to use him as a Life Orb attacker with Calm Mind over Shadow Ball, but I replaced it for this Hall streak mainly because of Shedinja (of course having an extra SE hit on some Pokemon is also nice). So about the set, there's nothing much to explain since it's Specs. Raikou is kind of frail but he's also decently strong to OHKO weaker Pokemon and fast enough to outspeed most things (this event lacks a +Speed nature, but since this is the Hall most things are lower leveled). Actually, I have something to ask about. I played this at level 50 because that's what all of my other Frontier Pokemon are at (since level doesn't matter elsewhere), but is it better to play at level 100 or the lowest possible level? I know that stats and damage calcs shift slightly, but I don't know at which end they're more advantageous. My last 2 were Flying and Bug. I was going to to Bug->Flying, but after getting through 5 or 6 Bugs, I looked at the list of Pokemon remaining and I was so afraid of what was left that I did Flying next and saved the last few Bugs for the end so I could skip one on 170. If I were to redo this I'd do Bug earlier. I lost to Hippowdon, which appears to be an auto-lose unless it somehow doesn't use Earthquake or I crit Hidden Power. Oh well. I am happy with this record because it was my first time actually reaching 170 and I managed to do it with a personal favorite of mine. One thing that I want to try in the future is Hall Doubles using this Raikou, but there are 2 issues. First is that I don't actually have a second one yet. I may still have a Wonder Card sitting in Platinum (I still haven't checked), but if not, then I'll have to RNG my roamer, which won't have Aura Sphere. The other thing is that Earthquake Pokemon will become more threatening if I can't OHKO them. I'd have to double up to KO one, but the second one could double-KO both of my Raikou with one attack. It's still something on my mind that I want to try later. Probably you thought of this already, but you could give the Raikous Focus-Sash or Shuca Berry instead of Specs. If they still can OHKO a foe without it, that should work since u can attack with both Raikous the left foe in round 2. Probably Shuca Berry is better, if its enough to stop Earthquakes, and leaves you enough HP to deal with one round of sandstorm. Air balloon of course would also be an option. The members.shaw.ca links for BattleSubwayData6.txt and BattleSubwayTrainers.txt are no longer available due to Shaw's service being shut down. Could someone with the files repost them on another platform? My highest Battle Subway record right now is 155. Most of my losses have been on my fault. Oh, I have a few teams. I use each team for 3 runs before switching. Teams #1, #3, and #6 are my personal favorite. An expert Doubles player, I see...well, now I have a bunch of ideas to steal from. While I have stuff going on in Maison & Tree, and I have plans for Castle, once all those are out of the way I will definitely be trying all of these out. The objective, of course, will be to beat that 155 mark. I've gone farther, but this should serve as motivation for me to keep pushing afterwards and finally get my Subway Starf Berry. Beware that the fast Pokemon are designed to hit a certain speed benchmark (ex. Outspeeding Scarf Manetric at x2 Spe). You can ask me if some EV is weird to you. Um... How do I access my Subway record in the game? Most Bronzong I've encountered on the Subway have been Heatproof. Okay, I've tried to dabble in Battle Subway, and I've made up a few teams. It is so hard to prepare against unfavorable matchups and hax in Subway Singles. There are so few options available. I've never gotten past 40 wins. The stuff of nightmare right here.